Drum Set Kid - fun for all! Best Drum Set app for kids and adults! Pretend to be a Rock, Heavy Metal or Jazz drummer. Realistic graphics and animations make you feel like you are playing a drum set. Just like a real drummer, play a drum roll and end it hitting the crash cymbal and bass drum simultaneously, or create new sounds by overlapping instruments. So simple to use, just tap your fingers on the instruments and choose from 11 music beats such as, Funky Rock or Reggae to play in the background while you drum. Design your own drum show too. 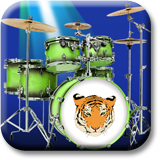 Pick your favorite drum color, bass drum logo, animations, and background spotlight colors. 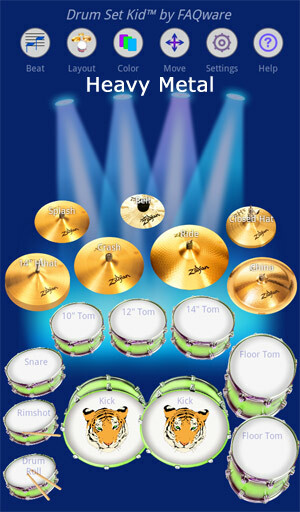 Move instruments around and save your custom drum kit layout for the next time you play. From the makers of Bongo Conga Drum Band and Magic Cat Music Teacher, never get bored again. Drum Set Kid offers hours of creative entertainment. Start with the Rock, Heavy Metal or Jazz drum set layout to learn how real drummers position their drums and cymbals. Then make and save your own custom layout with a simple tap on the Move button. Try tapping the bass drum and crash cymbal at the same time. Play a snare drum roll and end it with rimshot and splash cymbal at the same time. Use external earphones or speakers for even better stereo sound. Granted it's not a real drum set, but Drum Set Kid is a ton of fun, a lot cheaper, and far easier to take with you wherever you go. Works on high-end tablets with minimum 512 Mb of RAM such as Kindles, Samsungs & Nexus 7. The current version now works on high-end smartphones that have minimum of 512 Mb of RAM, such as Samsung Galaxy S3/4/5. If you have an older version of Drum Set Kid, please get this latest free update. Nook is a registered trademark of Barnes and Noble, Inc.; Kindle is a registered trademark of Amazon, Inc.